Can PGA Pros Use Rangefinders During Rounds? Padraig Harrington uses a rangefinder, legally, during a practice round prior to the 2010 PGA Championship. The Professional Golfers’ Association of America doesn’t permit golfers to use rangefinders during competition on any of its pro tours, including the PGA, Nationwide and Champions tours. 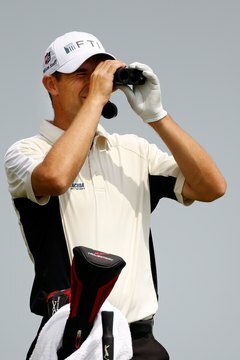 Players or caddies may use rangefinders on the course during practice to help create or modify a yardage book that they may consult during the actual tournament. As of 2012, the use of rangefinders is not mentioned in the PGA Tour’s official Player Handbook & Tournament Regulations guide. However, Rule 14-3b of the United States Golf Association’s Rules of Golf bans “artificial” devices used for “gauging or measuring distance” or other conditions of play, such as the course’s slope or the day’s weather. The penalty for violation of Rule 14-3b is disqualification. Yardage books are not considered artificial and are therefore permitted during play. All-time NFL great wide receiver Jerry Rice, who had a brief stint on the Nationwide Tour, was disqualified from the 2010 BMW Charity Pro-Am after his caddie used a rangefinder during the second round. Under the Rules of Golf, a player is responsible for any rules violations committed by his caddie. Pursuant to USGA Decision 14-3/0.5, a tournament committee may adopt a local rule permitting the use of rangefinders for distance measuring only. As of 2012 there is no indication that the PGA will permit the use of this exception in tournament play. But the exception is available to a variety of local and amateur competitions. According to the USGA decision, any rangefinder used during competition may not even be capable of measuring anything that affects the golfer’s play, such as wind speed or humidity. Additionally, the device cannot be capable of offering advice on club selection or of helping the golfer to read a green. Under a local rule permitting rangefinders, golfers may use devices such as smartphones or PDAs -- provided they measure distance only -- according to Appendix IV, Section 5, of the Rules of Golf. Prohibited, however, is any application in violation of Decision 14-3/0.5. Binoculars with no distance-measuring attachments are legal pursuant to Decision 14-3/2, even without a local rule, but the use of a compass is not, according to Decision 14-3/4. In the absence of a local rule, golfers may not attach distance meters to golf carts, under Decision 14-3/1. How Much Is It to Sponsor a PGA Player's Hat?